Make in an 8 x 8 pan. In a saucepan over low/medium heat, bring the butter, corn syrup, sugars and cocoa powder to a low boil. Stir continuously. Once the mixture comes to a boil, remove it from the heat, and stir in the vanilla. 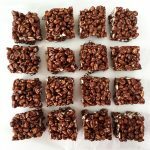 Pour the chocolate mixture over the puffed wheat, and mix well.